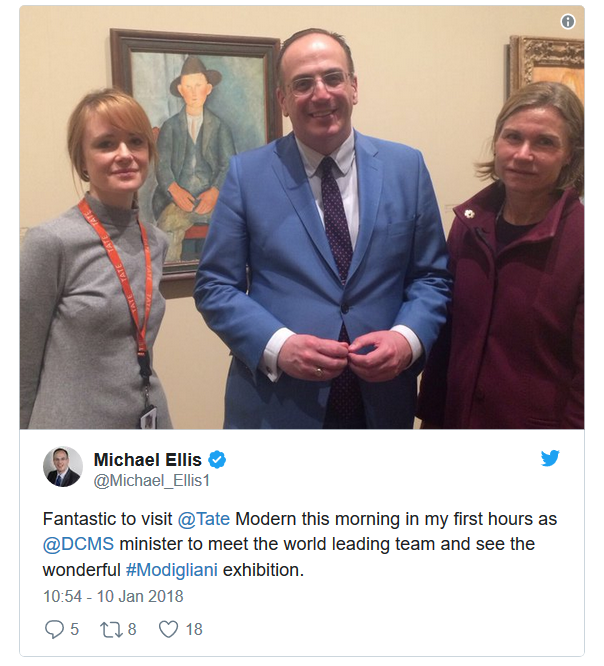 Two days after reshuffling the UK cabinet, key roles are yet to be handed out, but the Department for Digital, Culture, Media & Sport (DCMS) Minister Michael Ellis still found some time to visit the Tate Modern for Modigliani exhibition, reports Telecoms.com (FinTech Futures’ sister publication). Previous Minister for Digital Matt Hancock received a promotion, now being the Secretary of State for Digital, Culture, Media and Sport, essentially in charge of the entire department, though he has a few new names to keep in line. Ellis and Margot James are two new Ministerial entries to the department, though what they will actually do is unknown (at the time of writing). Whilst the majority of us might be concerned that our job was undefined, such minor details of course do not bother politicians. Especially when there is an opportunity to shake some hands and show off the pearly whites with a photo op. As you can see on the right, Ellis seems happy with his new remit. We were curious about who would be taking over the important task of readying the UK for the connected economy, and ensuring the country’s digital credentials don’t continue to slide downwards, so we called the Department’s media team. During the call, we were told decision on who would be leading what aspect of the department has not yet been made, and we should keep an eye out on the DCMS Twitter page for any announcements. This might be this afternoon (10 January), but more likely tomorrow morning.We did wonder why there was a hold up, but initially assumed it was just a case of the public sector moving at its usual pace. But with Ellis galivanting around London taking in the sites, while the rest of the poor team are slumming it in front of a laptop, the delay is starting to make a bit more sense. As you can see, these are all areas which might be considered crucial as the country readies itself for the era of connectivity and internet businesses. If you do happen to spot Ellis wandering around London’s Southbank this afternoon, feel free to give him a prod and tell him to get back into the office. The London Eye will still be there on Saturday.